Your Grace is Sufficient: Are you a Pharisee? It’s always hard for us priests to preach today’s gospel. Firstly, it sounds too much like us. Aren’t we the modern day usual suspects of the accusations laid against the Pharisees? Aren’t we guilty of holding court at every mass whilst sitting on the presidential chair? Aren’t we constantly pushing church rules down people’s throat while not lifting a finger to alleviate the laity’s burdens? Aren’t we reveling in being called “Father” and given seats of honour at dinner tables? Aren’t we all dressed up and dolled up in our colourful flashy vestments, with someone once telling me that the colours remind him of the Power Rangers? Secondly, even if I were to tell you that the Lord was not speaking about priests specifically but about the possibility of anyone who demonstrated those same vices as the Pharisees did, many of you sitting in the congregation would not be so easily convinced and thus conclude that I am just being defensive, and that’s sufficient proof of my guilt. Case closed. That’s a Catch 22 for you. Talk about name calling, Jesus holds nothing back! Who were the Pharisees? They were a sect of Jews who were very strict in their observance of the rituals, rules and regulations of their religion. The problem with the Pharisees was not their strict observance of religion nor even what they taught. It is their use of religion, the very thing that is meant to take us out of ourselves, as a means of aggrandising the ego. Therefore, the Law, custom, practice, religious dress, titles, all become ways of trumpeting the self. Rather than leading the people to God, these were used to draw greater attention to themselves. On the outside, the Pharisees seemed to fulfil the Law, but on the inside they were far from the love of God and the fulfilment of the Law. The Lord saw through the layer upon layer of self-deception, self-serving agenda, trickery and self-righteous posturing. Looks good on the outside but what about the inside? And so the Lord began to unmask the hypocrisy of the Pharisees. The word hypocrisy comes from the Greek word HUPOKRITES which means an actor on a stage. It means saying one thing but really living another. It is looking like an angel in church on Sunday but living like the devil the rest of the week. If a person does not pretend to be perfect, then he is not a hypocrite. It is when we put on a righteous act for others to see in public but then do the opposite in secret. This leads us to the point of this passage. Rather than trying to unmask the hypocritical Pharisees in today’s modern context, it would be much more logical and honest to admit that anyone of us could easily fall into the same trap. The problem is not rules or traditions themselves. After all, the Lord Himself said, “I have come not to abolish [the law and the prophets] but to fulfil them” (Matthew 5:17). In addition, He told His followers, “Whoever then relaxes one of the least of these commandments and teaches men so, shall be called least in the kingdom of heaven; but he who does them and teaches them shall be called great in the kingdom of heaven.” (Matthew 5:19). Although it is common in today’s antinomian world to condemn anyone who supports a tradition or rule as “Pharisaical,” this clearly was not the point of Christ’s warning. Instead, He condemned only those who support traditions that lead people away from a relationship with God. In fact, the new Pharisees of today downplay Catholic doctrine, minimise the importance of the Sacraments, ridicule traditional Catholic devotions, scoff at Catholic moral teachings, and blatantly break laws that are meant to keep their ego in check. When we actually turn to the authentic Tradition of the Church and rely on the wisdom of her teachings and discipline, it is not because we are attempting to be holier-than-thou. In fact, quite the opposite. Being obedient to liturgical rubrics, Church teachings and discipline, are acts of humility. It is acknowledgement that the collective wisdom of the Church is so much wiser than our puny wisdom. It is only arrogance that seeks to discard these things and presume that we are entitled and even mandated by Christ to alter and change things to fit with our notion of what is correct or in line with the spirit of this age. It’s good to note that if the words of the Lord were spoken today, any one of us could easily be lumped into the same category. 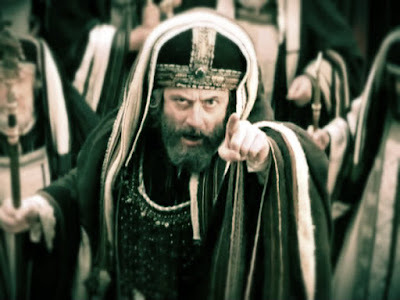 Whenever we choose not to practice what we preach, “we are the Pharisees;” whenever we insist that others should follow the rules that we set and yet seem to be exempt from those same rules, “we are the Pharisees;” whenever we choose to point the finger at others and call them Pharisees, “we are the Pharisees;” whenever we feel smug over our own spiritual superiority and look at others with contempt, “we are the Pharisees;” whenever we aspire to positions of honour or seek to be praised by others, “we are the Pharisees.” Ultimately, we must deal with our own inner Pharisee. When we do, the whole world begins to look different. Realising that, we may not stand on the outside like spectators, looking in at the gospel. Rather, we must find ourselves within it and let the living Word speak to us, judge us, purify us, strengthen and impel us as it did centuries ago, as it does today and as it will for all eternity.